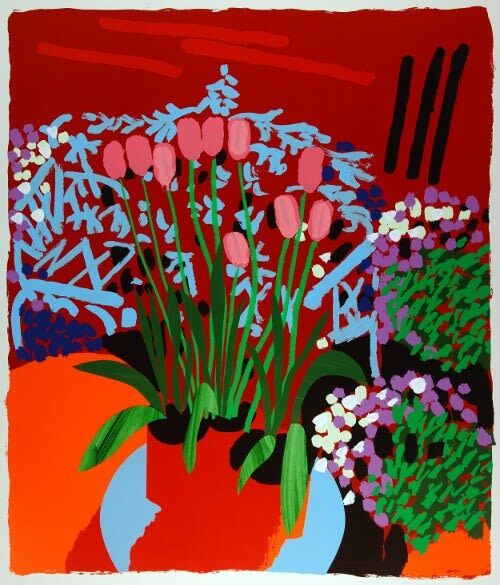 Bruce McLean is one of the major figures of contemporary British Art. Born in 1944 he studied at Glasgow school of art and at St. Martin’s in London, where he was taught by Anthony Caro. He found the attitude there ponderous: “Twelve adult men with pipes would walk for hours around sculpture and mumble.” In reaction Bruce McLean turned to making sculpture out of rubbish, to performance art and to producing photographic works in which he often posed. All his work brilliantly sent up the pompousness of the art world and mocked established art forms. He was given an exhibition at the Tate Gallery at the age of 27. From the late 1970s he has made paintings and prints in which humour remains central. After St. Martin’s Bruce McLean went on to teach at The Slade School of Fine Art. His early reputation arose from his activities as a sculptor involved in performance art. He has obtained international recognition for his paintings and prints, work with film theatre and books. Bruce McLean’s bold and confident approach to print making proved influential to his contemporaries and also to a generation of younger artists. Bruce’s work is in private and public collections world-wide and he has had numerous one man shows in both Europe and North America. These include The Tate Gallery, the Modern Art Gallery in Vienna and The Museum of Modern Art Oxford.